Episode Brett Hull (216):METRO DIVISION PREVIEW. SPECIAL GUESTS Brenton and Mike from It’s A Hockey Night Podcast Join Us! Brenton and Mike from the It’s A Hockey Night Podcast join Dale and Mike to preview the Metro Division and hilarity ensues. We also give very reasoned opinions on the Max Domi suspension and Dale clarifies some incorrect assumptions about water buffaloes in Stirling. Banter – Dale’s sore after framing a house. 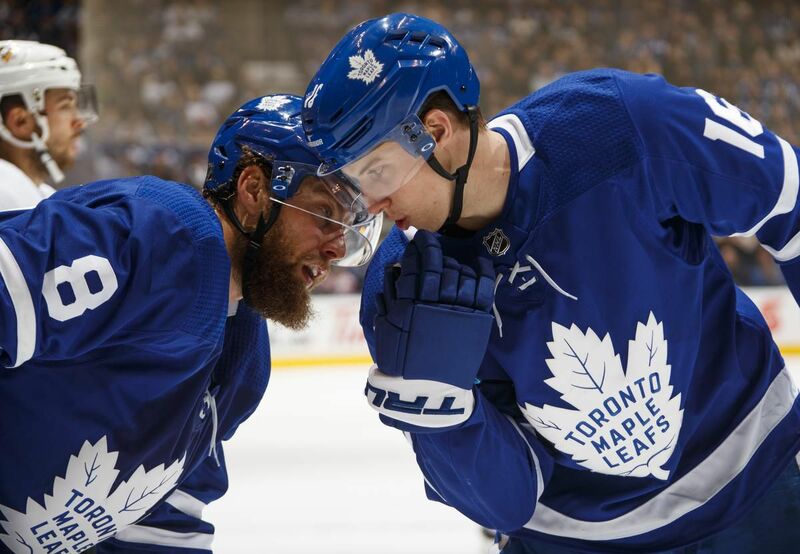 The Leafs and Oilers are undefeated in preseason – what does this mean for the regular season? Brenton Retallack on the It’s A Hockey Night YouTube channel. Episode Connor McDavid 2.0 (197): Golden Knights 1st Team to 2nd Round. Sharks, Jets, Lightning, Pens Go Through. What will John Carlson get in free agency? Knights sweep the Kings, scoring only 7 goals. Episode Brent Burns (188): SPECIAL GUEST: Anya Battaglino Talks TEAM USA GOLD! Pete is Back! Trades! Brassard to Pittsburgh. TOTW Montreal Canadiens. We welcome Anya Battaglino back onto the show to discuss the Team USA gold medal and give us an update on the NWHL. Mike had some unique seats at a Leafs-Islanders game this week and Pete’s back to give us the low-down on the Habs as they are featured in this week’s Team of the Week. Opening Banter – welcome back Pete. Mike gets to sit between benches at Leafs game and gets lots of air time on TSN! DOPeS – SHOCKER! NHL misses the boat on Miles Wood suspension. Grabner to NJ in trade with Rangers! Dale and Mike go to Puck Talks in Toronto then to Pittsburgh Penguins and Columbus Blue Jackets games on the weekend. TOTW Chicago Blackhawks. Olympic Hockey ramps up. Another ScuttlePuck episode sponsored by HealthIQ. Banter – Puck talks in Toronto. Some good scoops delivered. Episode Martin Marincin (185): Al Mitchell of TSN 1260 and The Athletic talks Oilers. TOTW Pittsburgh Penguins. McDavid Scores 4! Al Mitchell of TSN 1260 and The Athletic gives us the vibe around the Edmonton Oiler fanbase and helps us figure out what is wrong. Dale returns from Jamaica to give his take on the Forsberg suspension and take us down another Rathole. Another ScuttlePuck episode sponsored by HealthIQ. What would he change about Oilers? Will Gretzky be the next GM? Rick Nash to be traded? Episode Tyler Myers (157):Penguins on the Verge of Repeat Stanley Cups! Crosby and Subban Mix it Up. Pittsburgh Penguins go up 3-2 on the Nashville Predators after a dominant Game 5 performance by Sidney Crosby. Crosby and Subban don’t like each other. We give our Game 6 predictions. Also, Brian Burke is in the news as he doesn’t seem to think Calgary city council appreciates the Flames. Banter – Mike defies death riding the Leviathan and Behemoth roller coasters at Canada’s Wonderland. Nashville Predators vs Pittsburgh Penguins – The Predators take game 4 to tie the series, but the Penguins bounce back and take game 5 with a dominant 6-0 rout. Crosby was on a mission in Game 6. Lots of nastiness with fights, and a match penalty on a cross check by Sissons. Brian Burke calls out the city of Calgary at a local luncheon and we question whether this was the best strategy. Will it kill any deal they had been working on?